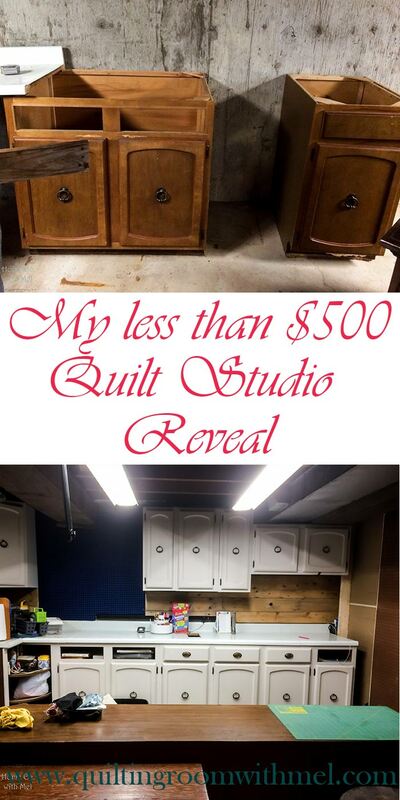 It took a year to turn a portion of our unfinished basement into a quilt studio. When it was just the two of us we didn't need a lot of living space. Then we got the grandkids and they like to run around so we had to start doing something to open up the living space for people. 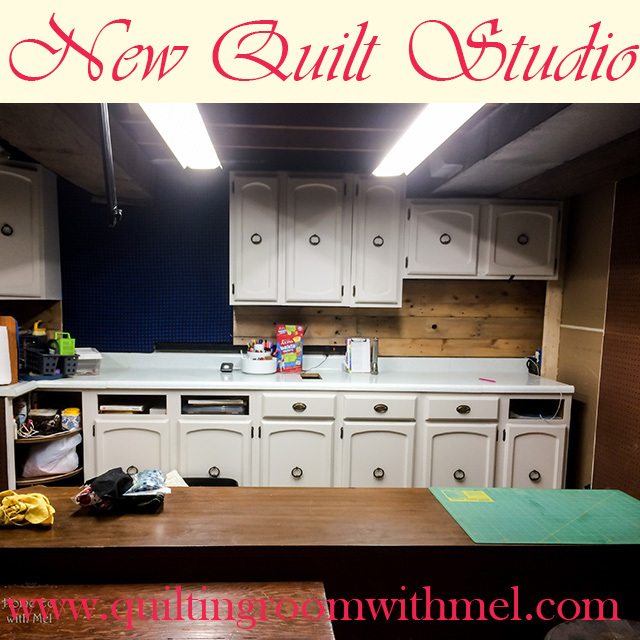 This quilt studio won't just allow that to happen but with some of the bells and whistles that we've added to it, it will allow us to create more content for all of you. That was really the most important part, we no longer have to redo the living space to take photos or film! The basement in our home has never been finished. It's over 50 years old and had been filled with all of the junk I have accumulated over the years. It took a while to sort through all of the stuff and it's honestly not done. The side that will be used for photography still needs to be cleaned and sorted. There are some emotional things on that side, we had a flood several years ago and some things got ruined. When I opened the box that held all of my ribbons from 4-H I had a small breakdown. I know I have to go through it but I needed to brace myself a little more before doing that. We divided are using about a third of our basement for this area. We split it into three sections, one section has finished walls and will be the backdrop for photos of finished items. It's not really exciting when it's done it will look like a typical living room but I don't have to worry about animal hairs on the furniture or dust collecting on it. Then we have a section to store sewing machines and cabinets. 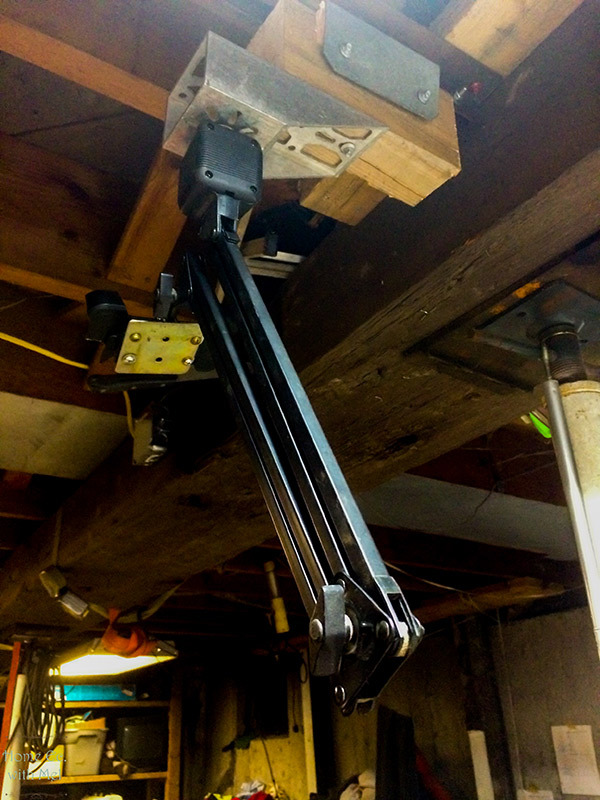 It will also make it easy to move any machine into the workspace. The workspace is where all of the fun stuff is so that's what I'm showing off today. Paul and I did this on the cheap. We haven't spent $500 on the whole project and that's including framing a couple of walls. One of the ways we did that was doing the work ourselves. I learned a lot about construction doing this. After we were done Paul admitted though it was the first time he had ever hung cabinets. The other thing we did was to reuses a lot of things. I didn't take a before picture but I'm sure you all know what an unfinished basement looks like, concrete floors and concrete walls. The cabinets I bought from someone I work with when they redid their home. These were well-built cabinets and survived the demo and reinstall with minor issues. There was one drawer that didn't make it and the area where the sink once was were going to be dead space. Paul put a shelf in both spots so while I don't have a drawer I don't have wasted space either. Once we got the cabinets up they really absorbed the light and let's face it that color is dated. 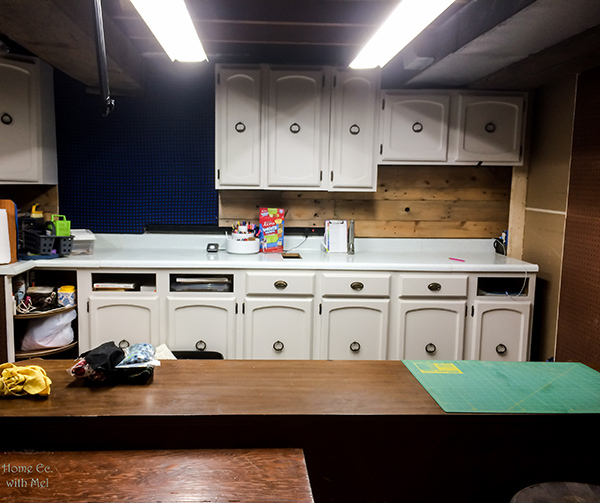 I had never painted cabinets before so I headed over to my friend Kim's blog and her round up of post on how to paint cabinets. I took a bit from several posts and did my own thing. I didn't sand, I used TSP substitute to clean and prep the wood. I also didn't do a prime and paint, I used primer and paint in one. I went with Kilz that I could get tinted and used starched linen as my color. I used the same thing on the walls of my photography room. I would like to update the hardware in the future though to kill the whole 70s vibe. You'll notice there's a hole in the counter. That will now be my hole for trash. It originally was a base for a blender. Now part of me understands easy access to wipe the counters straight into the trash is very important the other part of me thinks a built in blender in my studio is a genius idea. Whip up a pitcher of margaritas and start creating sounds good right? The backsplash is probably my second favorite part in the area, I'll get to my favorite part in a minute. I'm a huge fan of Fixer Upper and Barnwood Builders. So I kind of combined the look of shiplap with the look of weathered wood. The wood is pallets that my daughter in law rescued from her work and we really did leave them outside for awhile to get some age on them. The black and blue plaid is a design wall so I can store blocks or fiddle with layouts. So my favorite part might be a little ridiculous but I had to have it. All of the power was in the ceiling so we had to install outlets where we could. I picked out an outlet with two USB ports in it. This means I can charge my phone or my iPad while I'm working. I use both for noise when I'm down there. I like background noise while I work, music or TV. 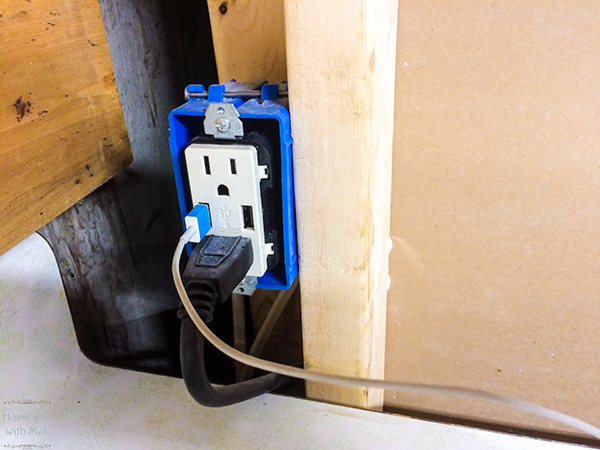 You'll notice the area behind the outlet is unfinished. That will be covered with sheet metal we just haven't had a chance to pick up the piece and I know that the workspace will never be this clean again so I'll share that with you all when it's done. 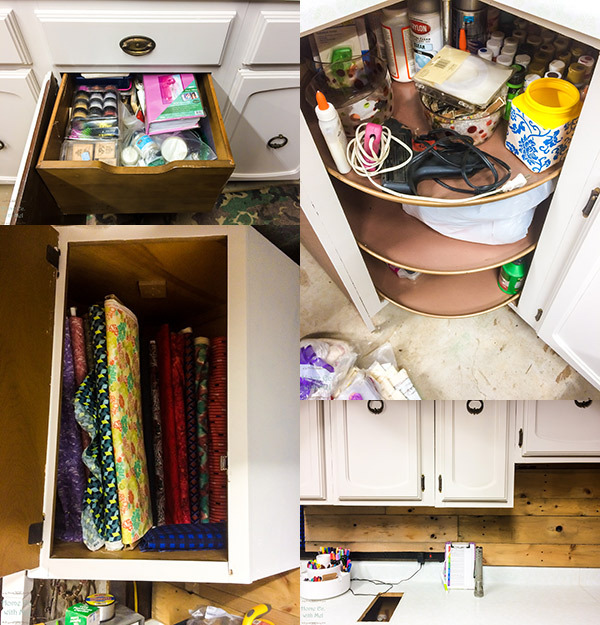 The rest of the cabinets are full of fabric, yarn, my paper crafting supplies and such. There's also a spot for air tools and chemicals for doing the cabinets. I knew I had a lot of crafting supplies but I didn't realize just how much until I started filling up the cabinets. I have two that are drawers and one is full of paper craft products i.e. stamps, inks, papers, punches, and the other is full of yarn for knit and crochet. I do have to give Paul some room for his stuff too. 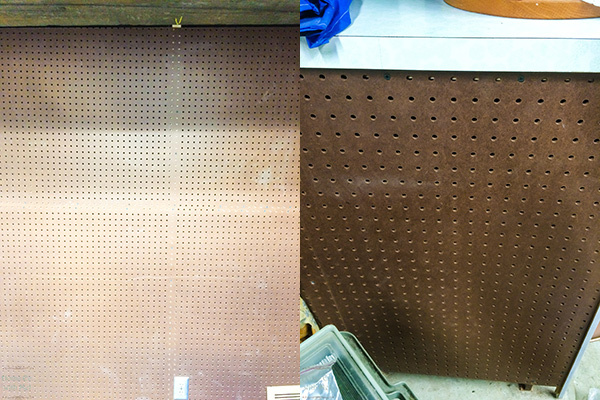 That's also where the full wall and the partial walls of pegboard are for, I'm sure I'll use part of it too. I'm actually planning on putting my rulers on one corner of the peg board. We need to get hooks and I'm thinking some of those baskets that hook into pegboards for parts for machines. On the other side of the room is this really great buffet. I need to do some more cleaning on it but that's easy. I did debate painting it as well because I saw the same one on Etsy for $1500 painted. I got this one for a trip to see the grand babies. It was a huge sacrifice, I mean I got to play with the babies and I got a buffet. This is where I'm housing my fabric, my overlock is in there, and my big books of quilt patterns. I bought some old patterns and some are inherited. The sad part is I found an online index of Kansas City Star patterns and I still don't have them all. The top of the buffet will be my video space. Paul built me a boom that will hold my phone so I can video anything I want. 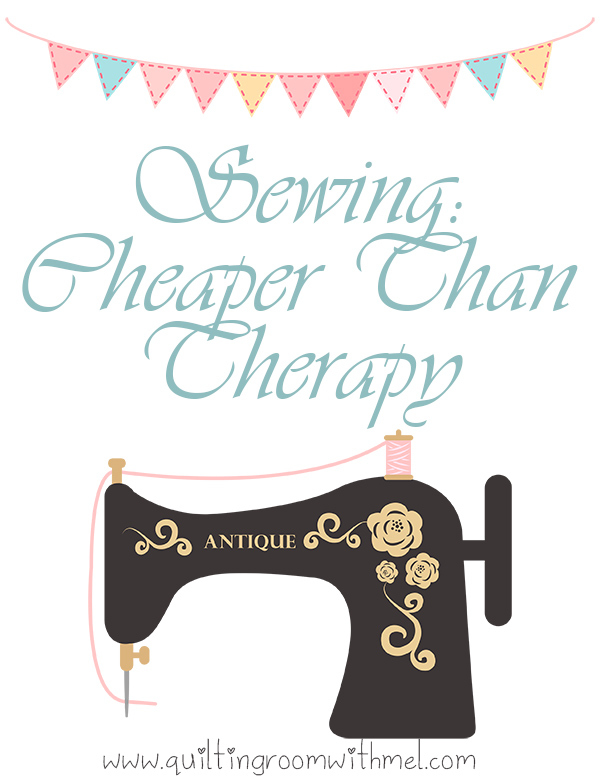 I have a new mat on its way from mynotions.com to replace my mom's old mat. It's time for it to have a break in life. I'm also doing their Facebook page content so it will make my life easier. Don't forget to sign up for the newsletter so you can see all of the things I'm making down here. You'll get this cute printable to add a little character to your sewing studio. I'm trying to decide where to put it in mine. So what do you think? Do you think you could get creative in this space? OH Mel, you and Paul did a GREAT job here! I am so excited for you. I understand about your mementos from 4-H and more. May you enjoy your space to the hilt!! Thank you for all the photos and details. For $500, it looks like you got a million bucks' worth of quilty space. It looks wonderful! This is fantastic, and I can't believe you only spent $500! Wow! I especially love the combination USB outlet. I may be asking my husband for one of those in my hobby room after seeing this one!